Ten Cents a Dance is about professional dance hall girls, who don’t come across like prostitutes at all. I mean, sure, they stand around, looking bored (“while you wait, you advertise”), waiting for a man to proposition them a ticket that represents a certain amount of money (and one even offers a guy private lessons), and the men in this situation spends most of the time together pushing how far the intimacy can go…. Okay, maybe a little like prostitution. Barbara Stanwyck is my favorite actress, bar none. 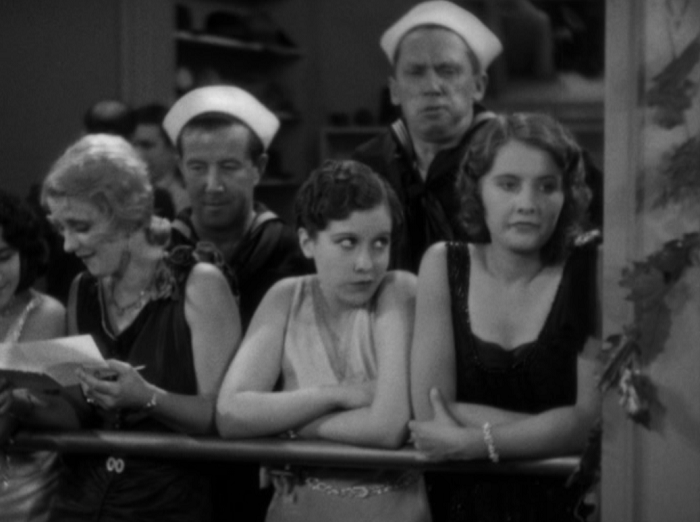 While Joan Blondell may be prettier and Ruth Donnelly more funny, no one had as much verve and vigor as Stanwyck. That being said, even I, someone completely bowled over by her charms, can admit that not every project is a perfect fit. 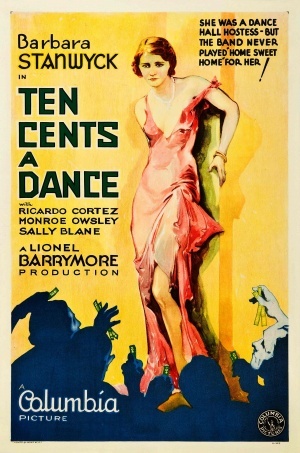 I think that’s where I’d have to categorize Ten Cents a Dance: decent movie, but a little miscast. The two kids enjoy a nice evening in the park. Stanwyck is Barbara O’Neill, one of many dance hall girls who get their kicks above the waistline but get their money from below it. Worse, she’s in love. No, it’s not with Bradley, the charming rich businessman who comes in and pays a dime just to listen to her melodious voice for hours on end. It’s Eddie, a college graduate living on his last dime and treating his every moment as the end of everything. Barbara’s so stricken with Eddie’s hard luck speech and espousal of romantic ideas (one particular night in the park is especially nauseatingly foreboding) pushes her into complete goo-goo-ville. She loans him $100 that Bradley had given her earlier because she wants him to be happy, and promises to take care of him. She even talks the compliant Bradley into hiring Eddie to do some of his accounting. How do you say no to that? I mean besides coughing and stuff. When he finds out how she makes her money, however, he flips out. He may be a poor, starving artist, but he has his pride. In fact, he has a massive amount of pride, so much so that he doesn’t tell his new coworkers that he’s married to Barbara. He doesn’t tell his old friend and their attractive sister, either, so it may be that Eddie’s pride is giving him a bit of a swollen head. Barbara is happy despite Eddie’s tantrums, and when she finds out that he’s embezzled $5,000 his job, she decides to help him by prostituting herself to Bradley. She doesn’t want to, but her love for Eddie compels her and she heads to Bradley’s apartment late at night to make her offer. One of the better looking shots of the film. Owsley is fine as a dirtbag that deserves to be hated, but this may be one of Ricardo Cortez’s finest roles. Usually playing the cad, here’s he’s a sweet romantic. He looks for the best in people, and thinks he finds that in Barbara until she begs him for money. His visible, puppy dog yearning for her, is both sweet and pathetic, and contrasts brightly with Eddie’s similar qualities; Eddie just manages to be a more well-rounded pathetic that Bradley is too kind for. 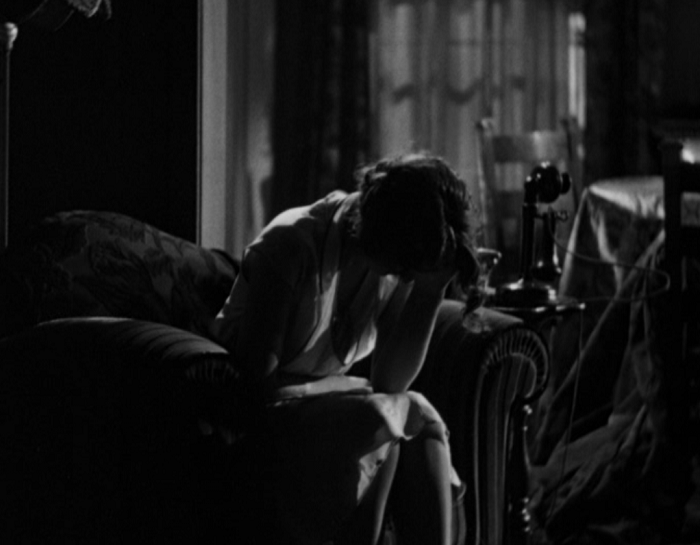 The moral is pretty Pre-Code, where Barbara and Bradley don’t end up doing the deed but Bradley’s heart is broken to see a woman he respects sink so low. Eddie suspects a coupling anyway, and, after his doting wife gives him a check for $5,000 to save him from jail, he insults and degrades her. She finally manages to stand up to him, and then Bradley laughs him off when Eddie tries to blackmail him out of revenge. Barbara’s ability to sublimate her dignity– at the dance hall, begging to Bradley– is seen as a great deal more humble and appealing than Eddie’s self righteous defiance. It’s not good enough to believe you’re better than everyone, but you must act upon it. Eddie’s self-loathing was an act, and underneath was a horrible beast whose greed and lust nearly destroyed an innocent woman’s life; this certainly seems like a reflection of the times. Prostituting, prostituting everywhere, and not a dime to spare. Moreso, the final romantic moment between Bradley and Barbara is tender and nice, and more or less surprising. Barbara honestly likes Bradley, but harbors no grand romantic notions towards him. But after she tells off Eddie, she realizes that Bradley idealizes her in the same manner that she loved her husband. Her last act is a different kind of prostitution, one born again out of kindness but one where she finally will get treated with reverence and respect. Isn’t that a good bargain? The film is directed by well-known actor Lionel Barrymore, and while I wish I could report this movie as proof that he was a genius behind the camera as well as in front, well, not so much. There are a few good shots and some good performances, but there’s no dynamism to the affair. He gets the job done. 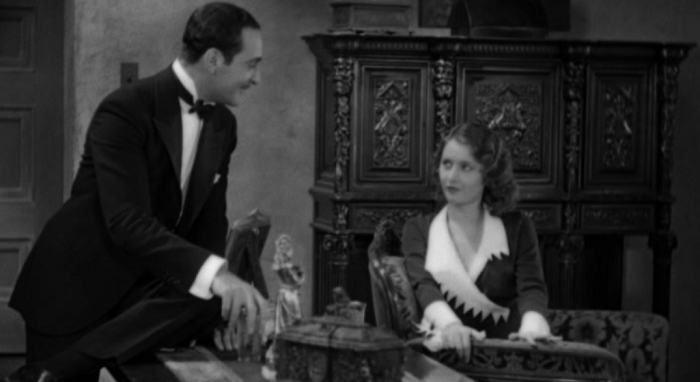 Which would be fine if the casting was a bit better, but, again, Stanwyck just isn’t the weak kneed girl we get in this picture, and I think that it suffers for it. Put someone a little more manic in there– Joan Crawford, maybe, or Constance Bennett– and it would have flowed better. But Stanwyck ain’t this. But, golly, she’s got a great smile, doesn’t she? This may be the first movie I’ve seen in recent memory that boasts in its title sequence of being based upon a song. Here’s Doris Day singing it; uh, I guess it’s not bad for a tuneless sort of number. Cliff over at Immortal Ephemera briefly touches on this in a post he did about a Barbara Stanwyck Pre-Code marathon on TCM. Not a lot on Ten Cents, but there are some really cool rare pictures and collectables to see. A lot of the reviews I read for this noted that Owsley apparently played an extremely similar role shortly before this movie, so most people weren’t too impressed to see him go back to the well. He’s good here, though, since it’s hard to make a unlikeable scumbag seem so mysterious to our likeable protagonist. Yes, Barbara Stanwyck is playing a character named Barbara. I doubt it was too confusing since ‘Barbara Stanwyck’ is a stage name. Her real name is Ruby Stevens; don’t ask me why she changed it! Mordaunt Hall’s original review from 1931 (scroll down) finds the film’s climax interesting, and that’s about it. Wow, even the film’s tagline is based on a song. This film is part of the Columbia Pictures Pre-Code Collection and is available on Amazon, and can be rented from Classicflix. Doris Day’s version of this song is not good, she doesn’t seem to know what the song is about. 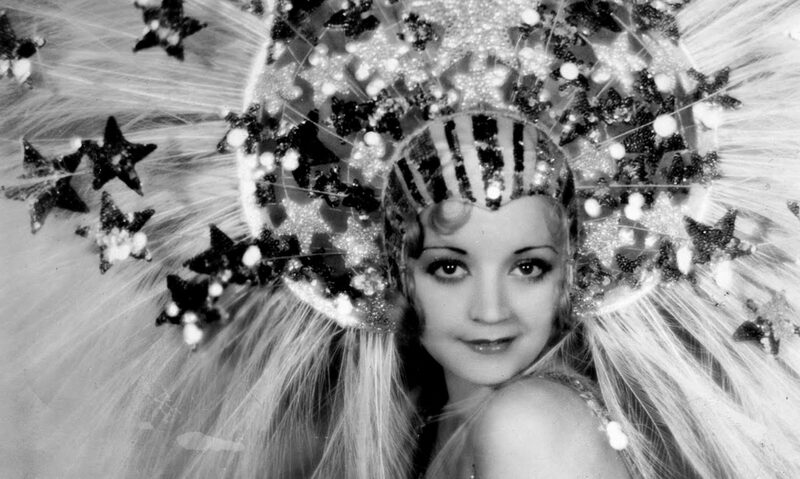 Ruth Etting’s version is wonderful (in my opinion). Well, like all, every Pre-Code-flicks- gentlemen walking in on women dressing, pulling stockings up, oops, the slip of their dress “strings” falling down.. The fact this movie shows ankles. That alone sums this as PC. But it also includes Woman to man saying” you need private lessons” hmmm.. A bit brazen for a lady back then, also “barbara” refers to a drink as ” milk”. My Mother in law still uses that term ( her father was a rum runner, and made a mean shine) oops “milk”. My late husband and I found a jar in a washer on the land we bought from my Father in law – WOW!! I’ll sum this up as Barbara Stanwyck is in this! Barbara is great in this for sure. And thanks for the story about the rum– I can’t even imagine finding that. Crazy!